AWS is leading the way in what is called a “great migration” to public cloud adoption. From educational institutions to telecoms, banking firms to manufacturing plants, and transportation, most businesses find AWS to be critical in their future business strategy. Enabling increased innovation for the business has been one of the reasons, why more and more sectors are attracted to using AWS services. Changing the way IT services are built and managed, the cloud giant has provided enterprises with several virtual resources to help manage storage, computation, and security. The industry focus is now moving toward real frameworks and applications, which provide specific abilities to integrate into existing software. Businesses are moving from cloud vendors that were providing infrastructure solutions to providers that are software and solution enablers. AWS is now focused on enabling companies to use more abstraction with service-oriented to particular application areas like artificial intelligence, machine learning, data collection, and analytics. To assist CIOs manoeuvre in the right direction while adopting AWS, a distinguished panel of CEOs, CIOs, VCs, and analysts, along with CIOReview’s editorial board has chosen the leading AWS providers. The companies featured here demonstrate an ability to implement innovative technologies combined with incredible customer service. During the selection, we have analyzed the vendors’ capability to fulfill the ever-growing expectations of flexible and low-cost solutions that will add value to the AWS landscape. 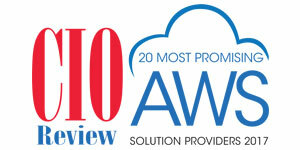 We present to you CIOReview’s 20 Most Promising AWS Solution Providers 2017. Triangle Cloud Services A consulting company that specializes in planning and managing cloud-based automated IT environments for small businesses to large enterprises.